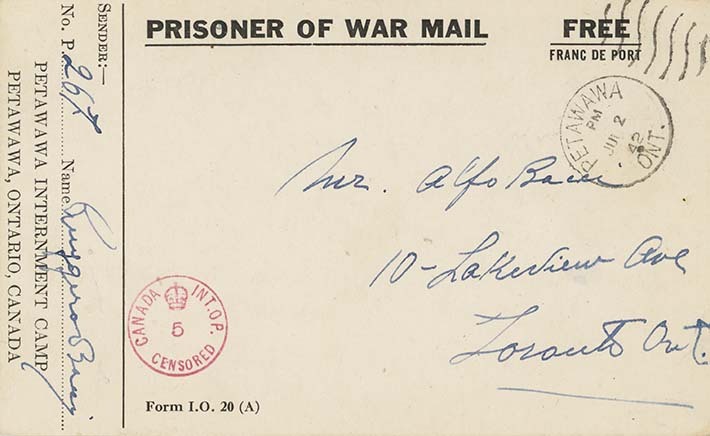 Internee Bacci writes to his youngest son, Alfo, that he is pleased to hear that everyone is well. He tells his son that they had their first snowfall in camp, but that it had been cold since September 29th. He asks his family not to worry about him, but he asks for more information on his wife's health. She had seen doctors recently. There is also an oblique reference that he will write Ottawa, but expects little assistance from those men, who are well and don't care. However, he writes to his son that justice will prevail one day.